Gorgeous photos and fun ideas! Many thanks for the kind comments Tuckshop Gardner. Much as I’d like to take credit for the photos, most of them were taken by my husband – I’m much better at gardening than I am at taking photos! 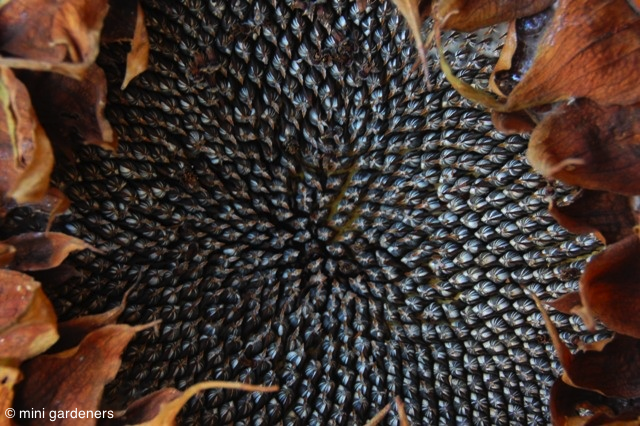 The patterns of the sunflower seed-head is enchanting, don’t you think? I agree Carolyn, I’m a bit reluctant to pull the seeds off because it feels like ruining a work of art! I think the arrangement of the seeds is supposed to be a good example of the Fibonacci series in nature. Loved looking at all the snowy photos on your blog – still sunny and warm here in London but fingers crossed it may snow this year.